Critical scholarship has had a long history of uneasiness with prophecy. In fact, most critical scholars outright reject it. Particularly their party line in the Old Testament is that the books were written later than tradition says, by someone other than who is traditional thought or attested too, and that all seemingly prophetic items were included after the events took place. These ‘retrospective prophecies’ (which are no prophecies at all) in scholarly opinion were written so that Israel as a people and nation could make sense of what God had done with it particularly in the Exile. The book of Isaiah has long been a lightning rod for critical scholarship for the last two plus centuries with many scholars settling on a view that Isaiah was composed by three authors instead of one. This view originated with Bernhard Duhm in the late 19th century calling for a tripartite division in the book of Isaiah (First Isaiah chapters 1-39, Second Isaiah chapters 40-55, and Third Isaiah chapters 56-66) reflecting three diverse authors over a lengthy span of time. While Duhm’s opinion won the day in most of Biblical scholarship for a time, many conservative scholars have always argued for the traditional view that Isaiah was authored by the one and only Isaiah son of Amoz (Isaiah 1:1). An understanding of the single authorship of Isaiah is very important in conservative scholarship and is even being revisited today as a real possibility by some more liberal theologians. Conservative scholars traditionally push back on the tripartite division of Isaiah by citing Isaiah 1:1, Isaiah 2:1, and Isaiah 13:1, all being introductions to sections of the book proclaiming Isaiah to be the author of the text being read. Other reasons include: the prolific quoting of Isaiah in the New Testament is always accredited to one author, including quotes by Jesus, Old Testament writers also quote from various parts of Isaiah, and the manuscripts of Isaiah, and particularly the scrolls from Qumran, have always been circulated as a whole, not to mention the fact that the early church fathers unanimously assert the sole authorship of Isaiah. All of chapter Isaiah 48:1-22 is proclaiming God to the prime mover, the one who moves and determines all of history, the one that should be trusted for direction in life, and the only one that should receive glory. In Isaiah 48:3-5 God gives us just a glimpse of why He gives us prophecy at all; because we are hard-headed and He wants us to see that He is in charge and respond in submission and worship when His words come to pass. God accomplishes this by revealing what He will do before He does it so that when it happens our faith is built up in God. 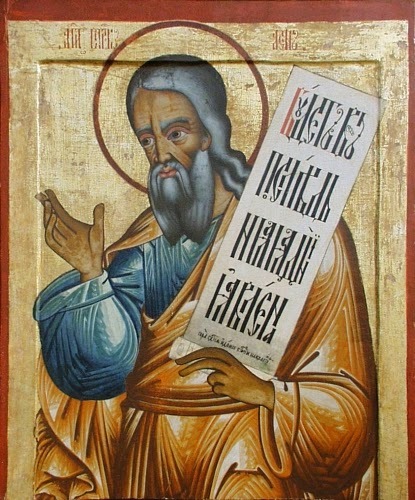 In short, to reject Isaiah son of Amoz’s own attestation of the authorship of Isaiah, especially because one cannot accept the prophetic passages in Isaiah, is to bow down to the idol of man’s reason and fall into the same trap as the people of Israel at the height of their pride in human ability. Isaiah living well before the exile was able to prophecy about things before the exile, during the exile, and after because God had revealed them for the purpose of moving Israel to worship Him. To reject the prophetic nature of Isaiah by claiming his prophecies were retrospective redactions is to reject part of the central message of Isaiah (and to be in a delusion –see Isaiah 41:29!) and to remain under the condemnation that Isaiah warns of. May God grant us the faith to be people that receive what He has revealed.